13th January 14: It is a great privilege for the Fabindians because Rajveer Singh of Class VIII has gone to play the Under 14 football tournament at national level. 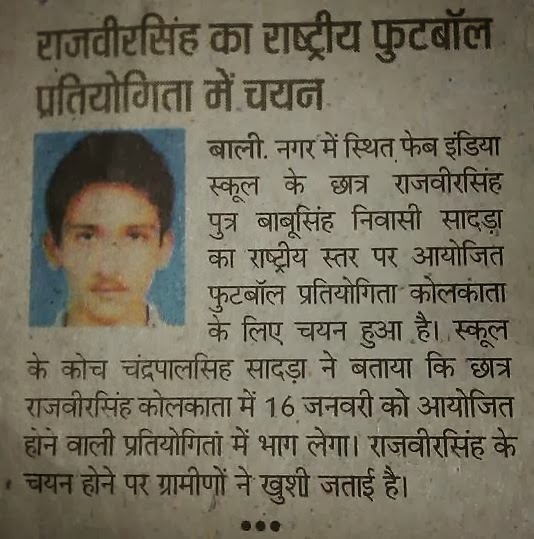 He is going to represent Rajasthan state. He is the only child who is chosen to play for the state from the surrounding four districts so we Fabindians are really proud of him. He has already played one match in Kolkata on 17th January 2014, which was telecasted on DD National and DD Sports. On the occasion of Makar Sakranti a kite flying competition was organized for the senior students. There were five participants from each house. The only girl participant was from Chanakya House which stood first in the competition. During my time at the Fabindia school I have been fortunate to work with a wide variety of students in various subjects. I have spent time assisting in the English classes for grades 2,3,4, and 5 as well as grade 9. I have also taught lessons about federalism, business, farming, and agriculture to grades 9 and 11. I helped design activities and worksheets for these classes and helped the teacher in whatever way possible! I have also enjoyed my time playing with the students during their games period, whether during soccer match or basketball game. I also introduced the great game of kickball to the class 4 students! The past few weeks have been wonderful and I have most enjoyed the spirit and energy of the students! I don't agree that boxing is a sport for only man of wrath. Boxing doesn't mean anger and all that .Anyone can take boxing as a career option if he is interested, it doesn't mean he is full of anger or dangerous. Boxing is a game and players should play it as its spirit. Many boxers who look cruel in the boxing ring are very polite, kind and jolly in their real life. During a match the person may show a lot of anger but who knows what they are in reality. To be a boxer is their choice but that doesn't mean that he is not a good person. I conclude by writing that boxing can be chosen by anyone as a career not only man of wrath.